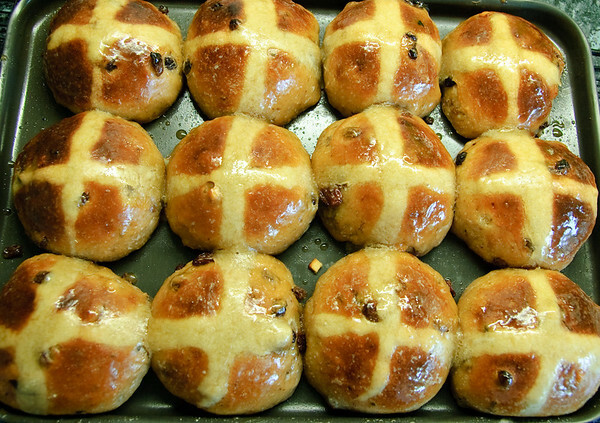 Last year I made hot cross buns and whilst they were OK, they weren't brilliant. This year I tried my hand at hot cross buns again, but this time using a sourdough recipe. 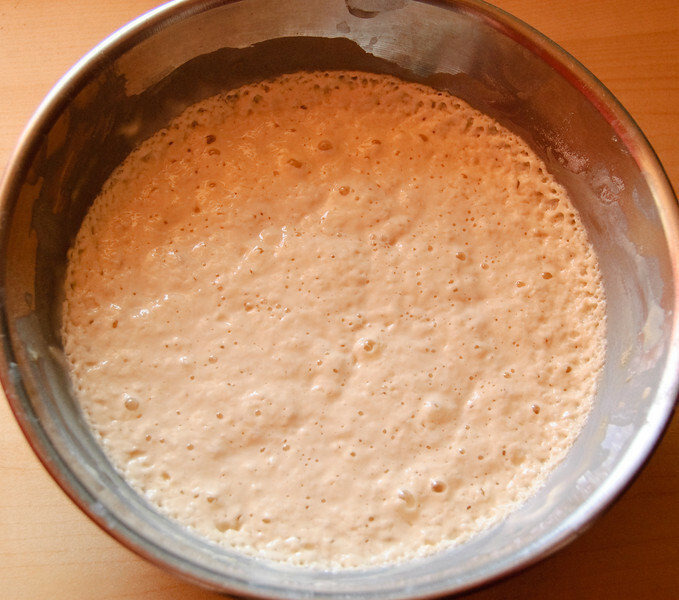 I have a sourdough starter that is heading towards it's second birthday so thought I'd use it to make hot cross buns. ... and leave for about 12 hours or overnight in a warm place. Soak 250g dried fruit (currants, raisins, candied peel) in boiling water and leave for 12 hours or overnight. Mix/knead briefly, leave for 10 minutes. Repeat. Simmer in saucepan until dissolved, and then a further minute or two. Glaze warm buns with sugar syrup after they come out of the oven. I used normal milk. Soy milk? You must be joking. I didn't have any allspice, so instead my spice mix was: ¾ tsp of mixed spice, ¼ tsp of cinnamon, ½ tsp grated fresh ginger. 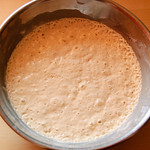 The dough came out very very sticky so I ended up adding probably another two or three handfuls of flour during the kneading stage. I needed to make two batches of cross paste as I ran out very quickly. After I'd baked my buns, Claire pointed out I'd actually used less spice than the original recipe and whilst the hot cross buns were very tasty, they were definitely lacking in the spice department. Next time I plan on upping the spice content, upping the flour by 100g and also adding some grated orange zest instead of having the orange candied peel from the fruit mix. It definitely could have done with a more pronounced orangy zing. Oh yes, and these hot cross buns were very very very yummy cut in half, lightly toasted and schmeered with butter :-p . I'll be making more of these this year, just without the crosses.